Given the diversity of animal life on our planet, it is not surprising that the animal diet would also vary substantially. The animal diet is the source of materials needed for building DNA and other complex molecules needed for growth, maintenance, and reproduction; collectively these processes are called biosynthesis. The diet is also the source of materials for ATP production in the cells. The diet must be balanced to provide the minerals and vitamins that are required for cellular function. The first step in ensuring that you are meeting the food requirements of your body is an awareness of the food groups and the nutrients they provide. 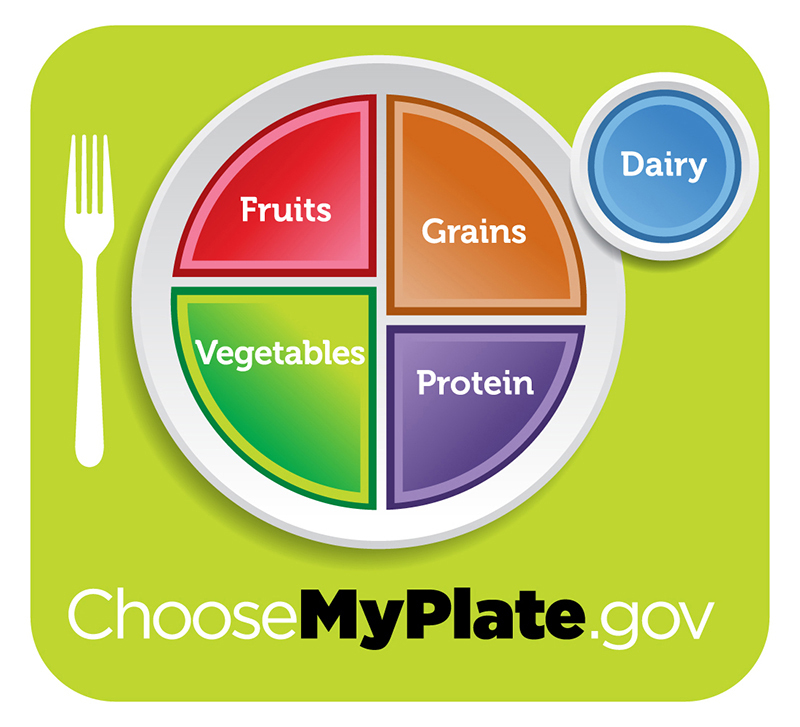 To learn more about each food group and the recommended daily amounts, explore this interactive site by the United States Department of Agriculture. The organic molecules required for building cellular material and tissues must come from food. Carbohydrates or sugars are the primary source of organic carbons in the animal body. During digestion, digestible carbohydrates are ultimately broken down into glucose and used to provide energy through metabolic pathways. Complex carbohydrates, including polysaccharides, can be broken down into glucose through biochemical modification; however, humans do not produce the enzyme cellulase and lack the ability to derive glucose from the polysaccharide cellulose. In humans, these molecules provide the fiber required for moving waste through the large intestine and a healthy colon. The intestinal flora in the human gut are able to extract some nutrition from these plant fibers. The excess sugars in the body are converted into glycogen and stored in the liver and muscles for later use. Glycogen stores are used to fuel prolonged exertions, such as long-distance running, and to provide energy during food shortage. Excess glycogen can be converted to fats, which are stored in the lower layer of the skin of mammals for insulation and energy storage. Excess digestible carbohydrates are stored by mammals in order to survive famine and aid in mobility. Another important requirement is that of nitrogen. Protein catabolism provides a source of organic nitrogen. Amino acids are the building blocks of proteins and protein breakdown provides amino acids that are used for cellular function. The carbon and nitrogen derived from these become the building block for nucleotides, nucleic acids, proteins, cells, and tissues. Excess nitrogen must be excreted as it is toxic. Fats add flavor to food and promote a sense of satiety or fullness. Fatty foods are also significant sources of energy because one gram of fat contains nine calories. Fats are required in the diet to aid the absorption of fat-soluble vitamins and the production of fat-soluble hormones. While the animal body can synthesize many of the molecules required for function from the organic precursors, there are some nutrients that need to be consumed from food. These nutrients are termed essential nutrients, meaning they must be eaten, and the body cannot produce them. The omega-3 alpha-linolenic acid and the omega-6 linoleic acid are essential fatty acids needed to make some membrane phospholipids. Vitamins are another class of essential organic molecules that are required in small quantities for many enzymes to function and, for this reason, are considered to be co-enzymes. Absence or low levels of vitamins can have a dramatic effect on health, as outlined in Table 15.1 and Table 15.2. Both fat-soluble and water-soluble vitamins must be obtained from food. Minerals, listed in Table 15.3, are inorganic essential nutrients that must be obtained from food. Among their many functions, minerals help in structure and regulation and are considered co-factors. Certain amino acids also must be procured from food and cannot be synthesized by the body. These amino acids are the “essential” amino acids. 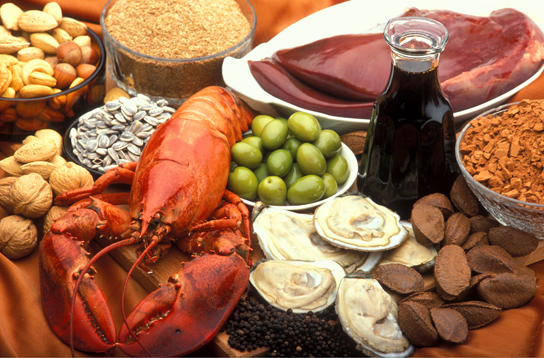 The human body can synthesize only 11 of the 20 required amino acids; the rest must be obtained from food. The essential amino acids are listed in Table 15.4. Essential nutrients can be synthesized by the body. Vitamins are required in small quantities for bodily function. Some amino acids can be synthesized by the body, while others need to be obtained from diet. Vitamins come in two categories: fat-soluble and water-soluble. 2. Which of the following is a water-soluble vitamin? 3. What is the primary fuel for the body? 4. Excess glucose is stored as ________. 5. What are essential nutrients? Essential nutrients are those nutrients that must be obtained from the diet because they cannot be produced by the body. Vitamins and minerals are examples of essential nutrients. 6. What is the role of minerals in maintaining good health? Minerals—such as potassium, sodium, and calcium—are required for the functioning of many cellular processes, including muscle contraction and nerve conduction. While minerals are required in trace amounts, not having minerals in the diet can be potentially harmful. 7. Discuss why obesity is a growing epidemic. 8. There are several nations where malnourishment is a common occurrence. What may be some of the health challenges posed by malnutrition? Malnutrition, often in the form of not getting enough calories or not enough of the essential nutrients, can have severe consequences. Many malnourished children have vision and dental problems, and over the years may develop many serious health problems. 15.2 Nutrition and Energy Production Copyright © by laesoph. All Rights Reserved.